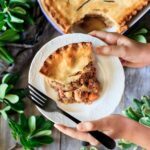 Old fashioned corned beef pie is a British comfort food dinner that your whole family will love. 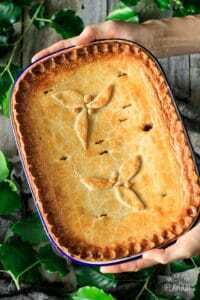 Potatoes, carrots, celery, and garlic flavor this old-fashioned meat pie made with homemade shortcrust pastry. Are you ready for a slice of history? 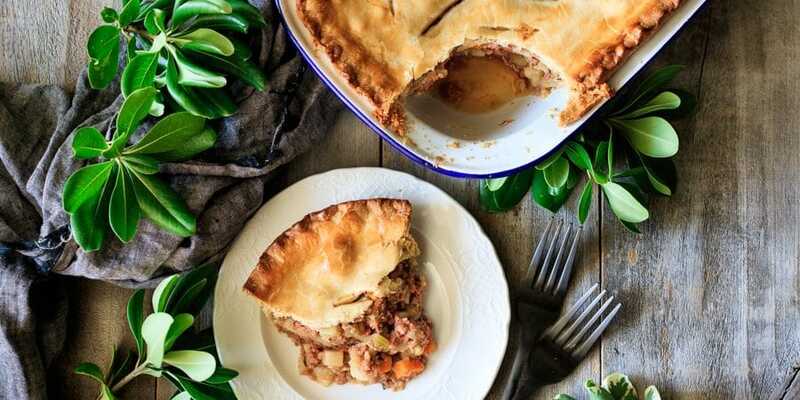 This corned beef pie actually has roots in the British Army. For over a hundred years, British soldiers were fed hardtack and bully beef, a finely minced corned beef mixed with a little gelatin, on the front lines. This meat was often made into sandwiches, but home cooks, in Wales especially, mixed the canned beef with potatoes and vegetables to make a flavorful pie. 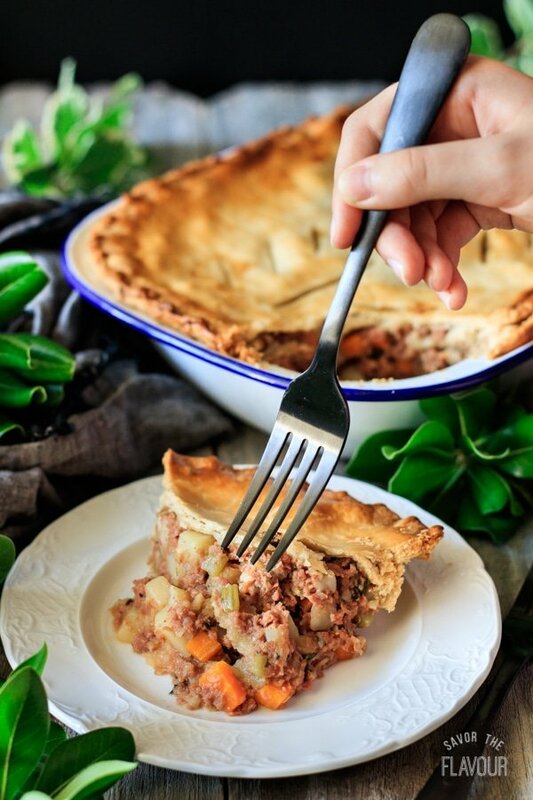 To make a delicious corned beef pie, you’ll need some yummy veggies, canned corned beef (or fresh), and some seasonings. Cook up those veggies in a Dutch oven for about 25 minutes, and you have a super flavorful, tempting-to-eat-some filling. Throw everything together to get a beautiful pie complete with homemade pastry. Just bake, and enjoy! Use good-quality canned corned beef for best flavor. If you’re really trying to up your game, feel free to use fresh corned beef you’ve cooked yourself. Make sure the filling has cooled off before assembling the pie. Boiling hot filling will melt the butter and lard in the pastry–which is not cool. Spend 10 minutes making your own pastry. Store-bought pastry isn’t near as tasty as homemade–plus it’s a lot of fun (and so much more rewarding) to make your own! Leftover corned beef pie keeps really well in the fridge. Your family can enjoy the leftovers for a few days! 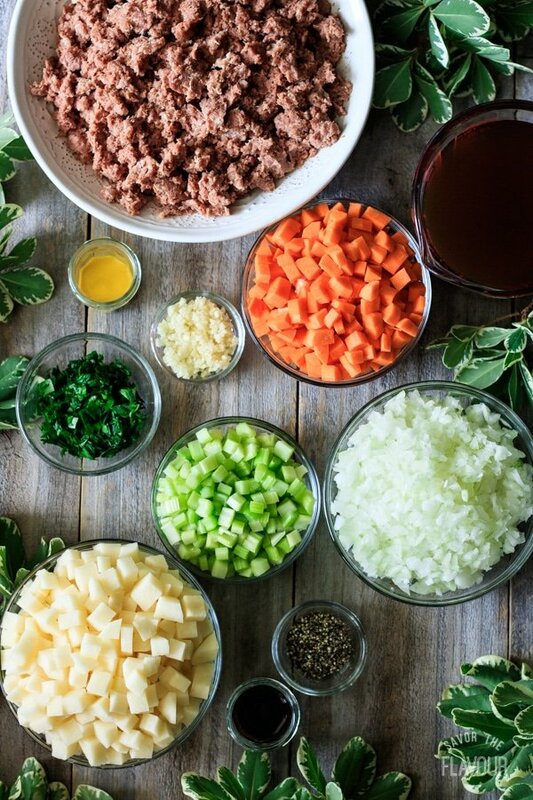 If you like this corned beef pie recipe, you’ll want to try these ones, too! Cheesy Ham and Potato Pie: cheese sauce, smoked ham, and sliced potatoes create this comfort food pie. How to Make Irish Dingle Pie: use up leftover roasted lamb in this flavorful Irish pie. 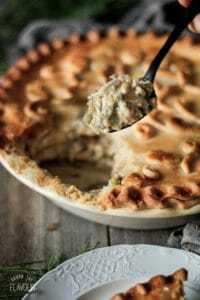 Creamy Chicken and Mushroom Pie: a classic British pie that the whole family will love. 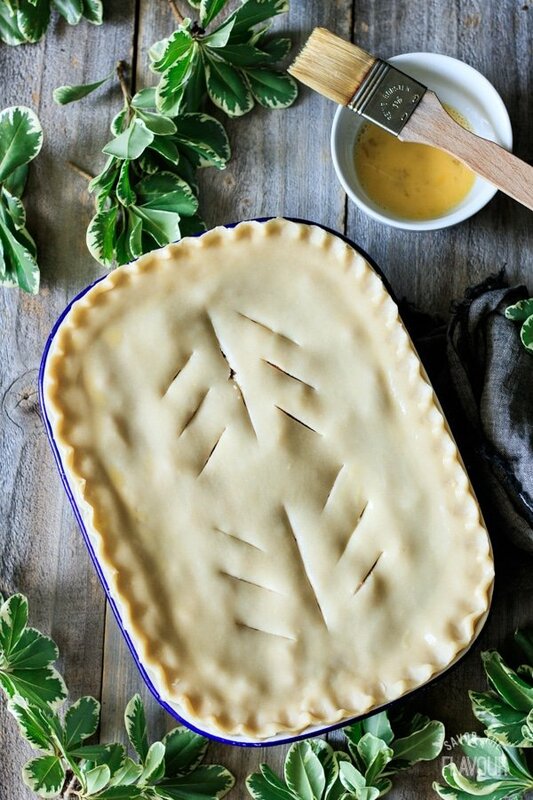 Did you make this corned beef pie recipe? We’d love it if you left a recipe rating and review! Pour the flour into a medium mixing bowl and add the butter, lard, and salt. Pinch the fats and mix together with the flour until the mixture resembles fine breadcrumbs. Mix in the vinegar and 2 tablespoons of water, then gradually add additional water until a smooth pastry forms. Knead gently a few times, then shape into a disc, wrap tightly in plastic wrap, and chill for at least an hour. While the pastry is chilling, make the filling. Melt the butter over medium-high heat in a Dutch oven. Once the butter is bubbling, add the onion, celery, carrot, and garlic. Cook for about 5 minutes, until the vegetables have softened. 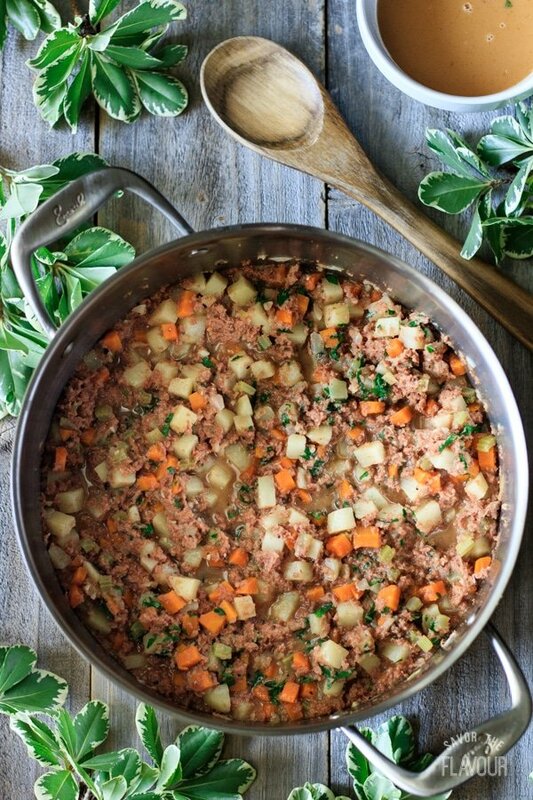 Stir in the potatoes and cook for another 5 minutes, then mix in the crumbled corned beef until well blended. Pour in the beef stock, Worcestershire sauce, English mustard, and black pepper and stir until combined. Cover and bring to a boil. Remove the lid and allow the mixture to simmer for about 15-20 minutes, until the potatoes and vegetables are cooked through, stirring occasionally. Skim off any liquid that hasn’t evaporated, then stir in the fresh chopped parsley. Pour the filling into a 9 by 13-inch cake pan and chill in the freezer for 20 minutes, stirring halfway through. Preheat the oven to 400 F. Beat an egg with a fork and set aside. Roll out the pastry on a lightly floured surface until it’s a little less than 1/8 inch thick. Line the base of a 6-cup (1.5 liter) pie dish with the pastry, trimming off any excess. Evenly spread the cooled filling in the pastry-lined pie dish, then brush the edge of the pastry with beaten egg. Re-roll the remaining pastry and cover the pie with it. Press down the edges to seal, then trim off the excess pastry. Crimp the edges as desired, brush the top of the pie with beaten egg, and cut a few vent holes in the top. Bake the pie for 45-55 minutes at 400 F, until the pastry is well browned. Cover the edges with aluminum foil if they brown too quickly. Let the pie stand for about 15 minutes before serving. Serve the pie hot or cold. The pastry and filling can be made the day before, and assembled and baked when desired. Leftover corned beef pie can keep very well in the fridge for a few days. Oh my days, this is so lush. We loved it with seconds requested. Every plate clean. Easy to make and would change nothing at all in the recipe. Didn’t make pastry, cheated and bought it. Just as good.